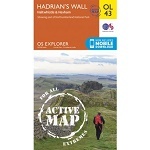 The OS Explorer Map Series is 4cm to 1km (2½ inches to 1 mile) scale and is the main stay used by many individuals and organisations involved in outdoor activities. It is the preferred choice for walkers, hikers, trekkers, climbers, mountain bikers, cyclists, horse riders and even water sports enthusiasts. Every part of England, Scotland and Wales is covered by 403 maps that include National Trails, Recreational Paths, picnic areas, viewpoints and selected places of interest. In addition, there's Rights of Way information for England and Wales. To select the Ordnance Survey map you require, first select the map number or area you are interested in by moving your mouse over the map and then click on the number to open the relevant page. 1:25 000 scale (4 cm to 1 km – 2.5 inches to 1 mile) The essential map for outdoor activities. Every part of England, Scotland and Wales - however remote - is covered by 403 maps specially designed for walkers, off-road cyclists, horse riders and all involved in outdoor activities. Map sheet number 102 in the OS Explorer map series is the perfect map for discovering the famous area around Land’s End, Penzance and St Ives. The area is well known as the most extreme south westerly point in Britain. Map sheet number 103 in the OS Explorer map series is the ideal map to use when exploring the area around The Lizard, Falmouth and Helston. Plenty of coastal walks and hiking opportunities on Goonhilly Downs. Map sheet number 104 in the OS Explorer map series is the ideal map for walkers, cyclists and holiday makers visiting Redruth and St Agnes. The Cornish coastline that dominates this area is perfect for outdoors enthusiasts and holds many attractions. Map sheet number 105 in the OS Explorer map series is the ideal map for walks, hikes and rides around Falmouth, Mevagissey, Truro and St Mawes. The South West Coast Path is an ideal way to explore the coastline in this part of Cornwall. Map sheet number 106 in the OS Explorer map series is the ideal map for anyone wishing to visit the Cornish coastal towns of Newquay and Padstow. The area is famous amongst holiday makers and is frequented by hikers, surfers and people wishing to sample the delights of the local towns and villages. Map sheet number 107 is the perfect map for anyone wishing to explore the area of St Austell and Liskeard. With lots of secluded bays, national trails and attractive towns the area is the ideal place for a Cornish holiday or day trip. Map sheet number 109 in the OS Explorer map series is the ideal map for planning a trip to Bodmin Moor and the areas in and around Camelford and Liskeard. Bodmin Moor is dominated by granite tors and the open plateau is great for active adventures. Map sheet number 110 in the OS Explorer map series is the perfect map for exploring the eastern edge of Dartmoor national park and the coastal areas of Torquay, Dawlish and Paignton. Map sheet number 111 in the OS Explorer map series is the perfect map to use when walking, cycling or camping in Bude, Boscastle and Tintagel. All three towns can be experienced when following the South West Coast Path. Map sheet number 113 in the OS Explorer map series is ideal for discovering the Hatherleigh, North Tawton and Lapford area around the north of Dartmoor national park. This area of Devon is rich in countryside and therefore perfect for all those who are passionate about their outdoor activities.